Three resources are needed for a production order: one work station, one or more staff members, and one or more tools. The staff members can serve all work stations and all tools can be used at all work stations. The planner works with production orders both scheduled and not scheduled. Resources can be added to not scheduled orders via a checkbox. A checkbox placed to the right outside the Gantt chart shows the resources used per order in the three resource groups. An order may need several resources of a group. Not scheduled orders don’t necessarily have to occupy resources yet, they can be allocated by checkbox. By drag & drop, the planner can manually add not scheduled orders to the already scheduled ones. When an order is moved, the resources possibly causing a conflict, are being indicated. The video shows how the graphical planning board actively supports the planner manually managing the production schedule by providing visual guidance. 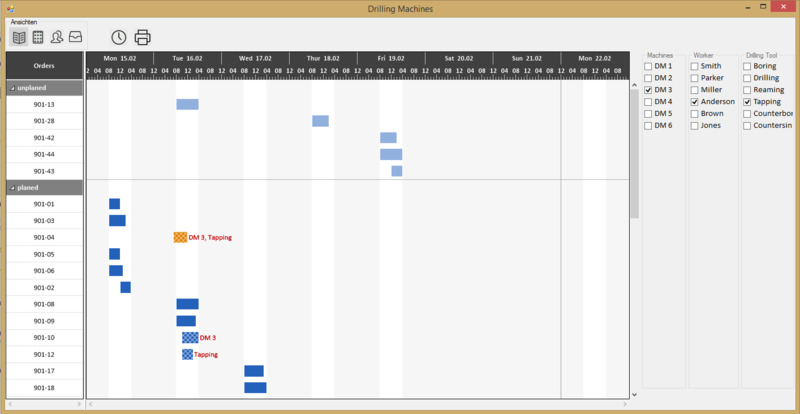 This visual scheduling sample application was developed with the .NET component VARCHART XGantt. Visualization lets the planner gain valuable decision support and enables him to react to unexpected incidents quickly and safely. This is only one example of how a graphical planning board could look like. Every production planning application has its own individual planning basis which needs to be reflected in the visualization. We develop interactive Gantt chart applications for many companies - and whether designed for project planning, production control, logistic, or staff scheduling – each of them exactly matches the underlying data and business logic. If you are on the look for a visualization to gain clarity on your planning process while at the same time being able to intervene manually, use our free consulting services. We are looking forward to every new challenge.